The force is strong lately, do you feel it? I do... Star Wars is upon us and the anticipation is building up. In honor of the new movie I've decided to create these little guys. Some of my young students are asking... When are we making Star Wars projects? 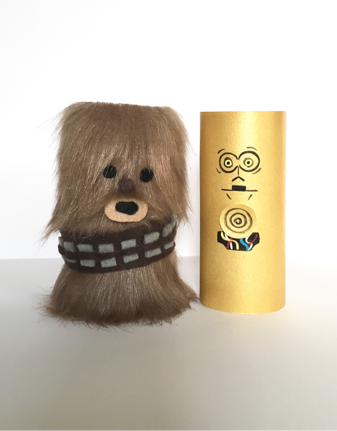 Well now is the time to visit a galaxy far, far away and make these with your little padawan! Step 1. For Chewbacca I cut a 4.25"x6" piece of brown fur, wrapped it around the tube and stapled it on. I made his strap by cutting a long piece of brown felt about 1"x6". Cut up small squares of gray felt and glued them on the strap. Cut a very thin strip of felt to glue on right down the middle. I used a hole puncher to cut small circles for the eyes and nose, and scissors to cut a mouth from felt. Step 2. For C3PO I painted a piece of cream colored cardstock with yellow gold paint, let it dry and then cut a 4.25"x6" piece to staple around the tube. I simply used reference from the Internet to paint on the face and some details of his midsection with acrylic paint. I cut out a small circle and glued it to the belly to give it a little 3D effect.